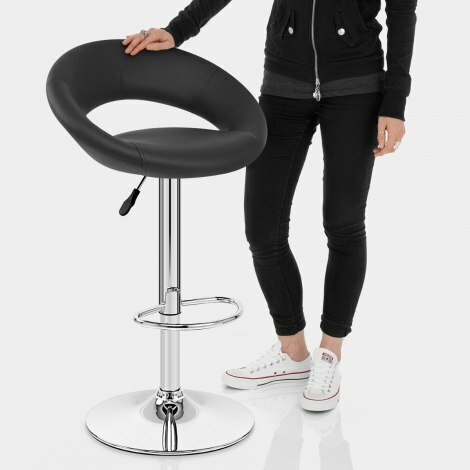 With a pioneering design brought to the UK first by Atlantic Shopping, the Padded Crescent Bar Stool has now been upgraded with more padding and a stronger more durable seat to keep it ahead of the game. A medley of both modern and retro design cues, the Padded Crescent has the ability to seamlessly meld into any environment, be that a contemporary breakfast bar or retro themed kitchen bar. 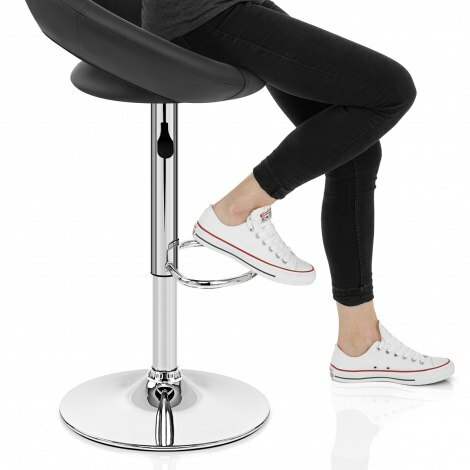 This comfortable, well padded bar stool takes its name from the crescent shape. The large round seat is covered in a black soft faux leather and provides a secure perch for relaxing and working. The well padded cushion gives superb amounts of comfort, enhanced by the sumptuous backrest. The large, arching backrest wraps around the cushion and gives excellent support for the lower back, making the Padded Crescent perfect for long hours of use. The strong frame boasts a mirrored chrome finish, bringing with it an aura of style and chic that will make a superb addition to any location. It has an adjustable height gas lift, 360-degree swivel mechanism, and a curved footrest that offers good support. This stool also has a protective ring to look after your floor. "Looks stylish excellent price and delivered on time"
Good quality stools. Very good price. Look lovely in my kitchen. Easy to put together and nice and comfortable. Good quality, stylish bar stools delivered in super fast time. Will use Atlantic again. I bought 6 of these stools and they were easy to put together and excellent value. Look neat because can fit under my work top. Definitely recommend. Excellent product and delivered promptly. Looks like very good quality and easy to assemble - 5 minutes tops. A present for my son so only just opened! Delighted with it!